Die Erfindung betrifft ein Verfahren zum Einrichten einer Bahnkurve für eine Robotereinrichtung. The invention relates to a method for setting a trajectory for a robot device. Ein Werkstück 1 mit wenigstens einer zu bearbeitenden Oberfläche O wird im Arbeitsbereich der Robotervorrichtung 2 angeordnet. A workpiece 1 having at least one surface to be machined O is placed in the working area of ​​the robot apparatus. 2 Eine Zeigereinrichtung 10 wird an einer Mehrzahl von Stützpunkten P1, P2, ... auf der zu bearbeitenden Oberfläche O positioniert. A pointing device 10 is positioned at a plurality of supporting points P1, P2, ... on the surface to be machined O. Die Koordinaten der Stützpunkte P1, P2, ... werden durch Erfassen der zugehörigen Koordinaten der Zeigereinrichtung 10 festgelegt. The coordinates of the points P1, P2, ... are determined by detecting the associated coordinates of the pointing device 10th Zwischen jeweils zwei benachbarten Stützpunkten P1, P2, ... wird automatisch gemäß einem vorbestimmten Algorithmus interpoliert, um die Bahnkurve K festzulegen. Between each two adjacent supporting points P1, P2, ... is interpolated automatically according to a predetermined algorithm to determine the trajectory K. Die Bahnkurve K wird auf die zu bearbeitende Oberfläche O projiziert. The trajectory K is projected onto the surface to be machined O. Die vorliegende Erfindung betrifft ein Verfahren zum Einrichten einer Bahnkurve einer Robotervorrichtung. The present invention relates to a method for setting a trajectory of a robot apparatus. Insbesondere ist das Verfahren für eine interaktive Einrichtung durch einen Bediener geeignet. Specifically, the method for an interactive means is adapted by an operator. Ferner wird eine Vorrichtung zum Durchführen des erfindungsgemäßen Verfahrens geschaffen. Further, an apparatus for performing the method according to the invention is provided. Die US 2005/0149231 A1 als nächst liegender Stand der Technik beschreibt ein Verfahren und ein System zum Programmieren eines industriellen Roboters. The US 2005/0149231 A1 as the closest prior art describes a method and a system for programming an industrial robot. Eine Zeigereinrichtung wird von einem Benutzer geführt und die Punkte auf einem zu bearbeitenden Objekt punktiert, die Teil eines Pfades eines Roboterwerkzeugs sein sollen. A pointing device is performed by a user and the dotted points on a object to be processed, which are to be part of a path of a robot tool. Die Position und Orientierung wird mit einer Verfolgungseinheit erfasst. The position and orientation is recorded with a tracking unit. Ein Pfadsimulator simuliert den momentanen Roboterpfad basierend auf der Liste von erfassten Punkten. A path simulator simulates the actual robot path based on the list of detected points. Auf einem Headup-Display wird der simulierte Pfad zusammen mit einer Abbildung des zu bearbeitenden Objekts als virtual reality image dargestellt. On a head-up display of the simulated path is displayed together with an image of the object to be processed as a virtual reality image. Aus dem Artikel "A Human-Robot Interface Using an Interactive Hand Pointer that Projects a Mark in the Work Space" erschienen in Proceedings of the 2001 IEEE International Conference on Robotics and Automation, 24–28 April 2000, Band 1, S. 589–595 beschreibt ein System für eine Mensch-Roboter-Schnittstelle. From the article "A Human-Robot Interface Using drop Interactive Hand Pointer did Projects a Mark in the Workspace" published in Proceedings of the 2001 IEEE International Conference on Robotics and Automation 24-28 April 2000, Volume 1, pp 589- 595 describes a system for a human-robot interface. Die Position einer Hand eines Betreibers wird erfasst und mittels eines LCD-Projektors an die erfasste Position eine Markierung projiziert. The position of a hand of an operator is detected and projected by means of a LCD-projector to the detected position of a marker. Die The DE 44 12 164 A1 DE 44 12 164 A1 beschreibt einen Operationstisch, bei welchem mittels eines Lichtzeigers Operationskoordinaten auf den Körper eines Patienten projiziert werden. describes a surgical table, are in which by means of a light pointer operation coordinates projected onto the body of a patient. Die WO 03/032129 A2 beschreibt ein Verfahren und System zum Visualisieren von Oberflächenfehlern durch optisches Projizieren eines topografischen Musters auf die Oberfläche. WO 03/032129 A2 describes a method and system for visualizing of surface defects by optically projecting a topographical pattern on the surface. Der Artikel "Laser-Based Guidance of Multiple Mobile Robots" erschienen in "Proceedings of the 2001 IEEE/ASME Int. Conference on Advanced Intelligent Mechatronics", 8.–12. The article "Laser-Based Guidance of Multiple Mobile Robots" published in "Proceedings of the 2001 IEEE / ASME Int. Conference on Advanced Intelligent Mechatronics", 8th-12th. Juli 2001, S. 410–415 beschreibt ein optisches Führungssystem für Roboter. July 2001, pp 410-415 describes an optical guidance system for robots. Die Herstellung einer Vielzahl von Produkten erfolgt heute zweckmäßigerweise durch Roboter und von Ihnen geführte Werkzeuge. The production of a variety of products is now expediently by robot and guided you tools. Bevor ein Roboter erstmals zur Herstellung einer neuen Serie von Werkstücken verwendet werden kann, müssen dessen Bewegungsabläufe programmiert werden. Before a robot can be used to produce a new series of workpieces for the first time, the movements must be programmed. Dies erfordert einen relativ hohen Zeitaufwand. This requires a relatively large amount of time. Der Zeitaufwand mag bei der Herstellung von Produkten in großer Stückzahl noch gerechtfertigt sein, ist aber bei der Bearbeitung von Einzelstücken oder der Herstellung von kleinen Serien häufig nicht mehr vertretbar. The time required may still be justified in the manufacture of products in large quantities, but is often not in the processing of individual pieces or the production of small series justifiable. Notwendige Programmänderungen bei Abwandlungen der Produkte, auftretenden Störungen des Roboters und dessen Wartung bedingen oft eine aufwendige Änderung der Programmierung. Necessary program changes in modifications of the products occurring disorders of the robot and its maintenance often require a costly change in programming. Nachteilig ist auch, dass die Programmierung nur von einem eingewiesenen Fachmann durchgeführt werden kann. Another disadvantage is that programming can only be done by a trained professional. Die Verfahren zur Programmierung können in zwei Typen unterschieden werden. The method of programming can be divided into two types. In einem ersten Typ (offline) werden mittels eines Robotermodells die Bewegungsabläufe ohne den Roboter programmiert. In a first type (offline) the movements are programmed without the robot by means of a robot model. Für die offline Programmierung sind dreidimensionale Modelle der zu bearbeitenden Werkstücke, der Arbeitsumgebung und des Roboters notwendig. three-dimensional models of the workpieces to be machined, the working environment and the robot are necessary for offline programming. Eine Erstellung und Anpassung dieser Daten erfordert einen erheblichen Aufwand. A creation and customization of these data requires considerable effort. Ferner sind in der Regel Optimierungsschritte des programmierten Bewegungsablaufs am realen Roboter unvermeidbar, da sich meist die dreidimensionalen Modelle und die von ihnen abgebildete Realität unterscheiden. Furthermore, as a rule optimization steps of the programmed motion sequence on real robots are inevitable because usually distinguish the three-dimensional models and the reality depicted by them. In dem zweiten Typ (online) wird direkt der Roboter programmiert. In the second type (online), the robot is programmed directly. Eine Mehrzahl von Stützpunkten werden von dem Roboter manuell gesteuert angefahren und die Posen des Roboters abgespeichert. A plurality of supporting points must be approached manually controlled by the robot and stored the poses of the robot. Die Auswahl der Stützpunkte und die manuelle Steuerung des Roboters bedarf jedoch eines speziell ausgebildeten Personals. However, the selection of the bases and the manual control of the robot requires a specially trained staff. Ansätze zur Vereinfachung der anfänglichen Programmierung bestehen darin, mittels einer Kamera die Arbeitsumgebung und des Werkstücks aufzunehmen und auf einem Monitor oder Datenbrille darzustellen. Approaches to simplify the initial programming consist in receiving means of a camera and the working environment of the workpiece and to display on a monitor or data goggles. Der Darstellung des Werkstücks wird eine simulierte Bahnkurve des Roboters überlagert. The display of the workpiece is superimposed on a simulated trajectory of the robot. Ein entsprechendes Verfahren ist aus A corresponding method is known from DE 103 05 384 A1 DE 103 05 384 A1 bekannt. known. Der dargestellte Ausschnitt hierbei wird durch die Orientierung des Werkstücks im Raum festgelegt. The detail shown here is determined by the orientation of the workpiece in the room. Der Programmierer erhält auf diese Weise eine Rückkopplung zwischen der von ihm programmierten Bahnkurve und deren Lage bezüglich des Werkstücks. The programmer receives in this way a feedback loop between the programmed by him trajectory and its location relative to the workpiece. Nachteiligerweise ist das Blickfeld durch die Abmessungen des Monitors bzw. der Datenbrille beschränkt. Disadvantageously, the field of view is limited by the dimensions of the monitor or the data goggles. Bei größeren Werkstücken erfordert dies eine permanente Verschiebung des dargestellten Bildausschnittes. For larger workpieces, this requires a permanent displacement of the image segment shown. Hierbei verliert der Bediener den Überblick über die gesamte Bahnkurve. Here, the operator loses track of the entire trajectory. Ferner ist die Abbildung der Bahnkurve durch die Auflösung des Monitors und der Kamera begrenzt. Further, the image of the trajectory is limited by the resolution of the monitor and the camera. Die The EP 1 215 017 A2 EP 1215017 A2 beschreibt ein Verfahren zum Einrichten einer Bahnkurve. describes a method for establishing a path curve. An einem Roboter ist eine optische Vermessungseinrichtung bestehend aus einem Projektor und einer Kamera befestigt. On a robot, an optical measurement device is attached consisting of a projector and a camera. In einem ersten Schritt wird das gesamte Werkstück von einem entfernten Punkt aufgenommen und die Aufnahme auf einer Anzeige dargestellt. In a first step the entire workpiece from a distant point is recorded and the recording shown on a display. Ein Bediener legt Vermessungspunkte entlang einer Bahnkurvemittels eines graphischen Werkzeugs und der Anzeige fest. An operator places fixed survey points along a curved path by means of a graphical tool, and the display. Der Roboter wird schrittweise entlang der Vermessungspunkte geführt und die Vermessungseinrichtung zeichnet die Topologie des Werkstücks entlang der Bahnkurve auf. The robot is guided progressively along the survey points and the measuring device records the topology of the workpiece along the trajectory curve. Die somit ausgemessene Bahnkurve dient zur späteren Führung des Roboters. The thus been measured trajectory is used for subsequent leadership of the robot. Eine Aufgabe der vorliegenden Erfindung ist es, ein Verfahren und eine Vorrichtung zu schaffen, welche eine einfache und verbesserte Einrichtung von Bahnkurven eines Roboters ermöglichen. An object of the present invention is to provide a method and an apparatus which enable a simple and improved means of trajectories of a robot. Das erfindungsgemäße Verfahren sieht folgende Schritte vor. The inventive method provides for the following steps. Ein Werkstück mit wenigstens einer zu bearbeitenden Oberfläche wird im Arbeitsbereich der Robotervorrichtung angeordnet. A workpiece having at least one surface to be machined is arranged in the working area of ​​the robot apparatus. Eine Zeigereinrichtung wird an einer Mehrzahl von Stützpunkten auf der zu bearbeitenden Oberfläche positioniert. A pointing device is positioned at a plurality of support points on the surface to be machined. Die Koordinaten der Stützpunkte werden durch Erfassen der zugehörigen Koordinaten der Zeigereinrichtung festgelegt. The coordinates of the points are determined by detecting the associated coordinates of the pointing device. Zwischen jeweils zwei benachbarten Stützpunkten wird automatisch gemäß einem vorbestimmten Algorithmus interpoliert, um die Bahnkurve festzulegen. Between any two adjacent support points is interpolated automatically according to a predetermined algorithm to determine the trajectory. Die Bahnkurve wird auf die zu bearbeitende Oberfläche projiziert. The trajectory is projected onto the surface to be machined. Ein Vorteil des erfindungsgemäßen Verfahrens besteht darin, dass ein Bediener unmittelbar an dem Werkstück die Bahnkurve einrichtet. An advantage of the method of the invention is that an operator sets up directly on the workpiece, the track curve. Hierzu kann er auf intuitive Weise geeignete Stützpunkte durch Berühren der Oberfläche mit der Zeigereinrichtung festlegen. To that end, set in an intuitive manner appropriate points by touching the surface with the pointing device. Ferner wird ihm dann auch die zwischen den Stützpunkten interpolierte Wegstrecke auf der Oberfläche durch die Projektion angezeigt. Further, the interpolated distance between the supporting points it is then displayed on the surface by the projection. Hierbei erkennt er sofort, ob die Wahl der Stützpunkte und deren Lage geeignet sind die Bahnkurve festzulegen. Here, now, he realizes that the choice of pivot points and their location are suitable to define the trajectory. Für eine Anpassung der Bahnkurve können Stützpunkte hinzugefügt, gelöscht oder verschoben werden. For adapting the trajectory points can be added, deleted or moved. Vor einem erstmaligen Festlegen von Stützpunkten kann auch eine vorab bekannte Bahnkurve auf das Werkstück projiziert werden. Before a first set of data points and a pre-known trajectory can be projected onto the workpiece. Dies ist insbesondere dann von Vorteil, wenn zu erwarten ist, dass die bekannte Bahnkurve nur geringfügig angepasst werden muss. This is particularly advantageous when it is expected that the known trajectory must be adjusted only slightly. Die Verfahrensschritte können auch mehrfach iterativ wiederholt werden, bis eine für die Bearbeitung des Werkstücks geeignete Bahnkurve ermittelt ist. The process steps may be repeated iteratively multiple times until a suitable for the machining of the workpiece trajectory is determined. Durch die Projektion der Bahnkurve auf die Oberfläche ist die Auflösung und Genauigkeit der Darstellung im Wesentlichen nur durch eine verwendete Projektionseinrichtung begrenzt. By the projection of the trajectory on the surface of the resolution and accuracy of the representation is substantially limited only by the used projection means. Diese ist wesentlich größer als die üblichen Auflösungen von Projektionsbrillen und/oder Bildschirmen von nur wenig mehr als 1000 × 1000 Punkten. This is much larger than the usual resolutions of projection goggles and / or screens of just over 1000 × 1000 points. Erfindungsgemäß werden die projizierten Bahnkurven optisch zu erfassen. According to the invention, the projected path curves to detect visually. Es werden abweichende Abschnitte der projizierten Bahnkurve bestimmt, in denen die projizierte Bahnkurve von der festgelegten Bahnkurve abweicht. There are determined different sections of the projected trajectory in which the projected trajectory deviates from the set trajectory. Abweichungsmarkierungen werden an und/oder entlang der abweichenden Abschnitte projiziert. Deviation marks are projected on and / or along the different sections. Das automatische Interpolieren nimmt eine vorgegebene Form der Oberfläche an, um entlang dieser Oberfläche die Wegstrecken zwischen zwei Stützpunkten zu bestimmen. The automatic interpolating assumes a predetermined shape of the surface to determine the distances between two points along this surface. Die Oberflächen können zB als eben, kugelförmig oder zylinderförmig angenommen werden. The surfaces may be assumed spherical or cylindrical shape for example, as flat. Die Form der Oberflächen kann auch durch ein dreidimensionales Modell, zB ein CAD-Modell, definiert werden. The shape of the surfaces can be a CAD model by a three-dimensional model, for example, be defined. Im Allgemeinen wird sich jedoch eine Abweichung zwischen der angenommenen Oberfläche und der realen Oberfläche ergeben. In general, however, a deviation between the assumed surface and the real surface will result. Diese Abweichungen lassen sich beim Projizieren der Bahnkurve erkennen. These deviations can be detected when projecting the trajectory. Durch die Abweichungsmarkierungen wird der Bediener darauf hingewiesen, dass die dem automatischen Interpolieren zugrunde liegenden Oberflächen, Formen und/oder Interpolationsfunktionen geändert werden müssen und/oder eine größere Anzahl von Stützpunkten in diesem Bereich notwendig sind. Due to the deviation marks the operator should be noted that the surfaces of the automatic interpolating underlying shapes and / or interpolation to be altered and / or a larger number of support points in this area are needed. Die Abweichungsmarkierungen können als Symbole projiziert werden. The deviation marks can be projected as icons. Eine andere Variante ist, in den abweichenden Abschnitten die Bahnkurve durch eine unterschiedliche Farbgestaltung zu den nicht abweichenden Abschnitten zu projizieren. Another variant is to project into the different sections of the trajectory by a different color scheme to the non-divergent sections. In einem automatisierten Verfahren kann die Bahnkurve solange angepasst werden, bis die bestimmte Abweichung unter einen vorbestimmten Schwellwert sinkt. In an automated process, the trajectory can be adjusted until the determined deviation drops below a predetermined threshold. Dies kann durch automatisches Hinzufügen von Stützpunkten oder Anpassen der Interpolationsfunktionen realisiert werden. This can be achieved by automatically adding bases or adjusting the interpolation functions. Ferner kann die Krümmung der Oberfläche basierend auf der Abweichung bestimmt werden und das automatische Interpolieren in Abhängigkeit der Krümmung erfolgen. Furthermore, the curvature of the surface can be determined based on the deviation, and take place automatically interpolating function of the curvature. Das optische Erfassen der projizierten Bahnkurven kann durch Triangulation erfolgen. The optical detection of the projected trajectories can be done by triangulation. Eine weitere Ausgestaltung des erfindungsgemäßen Verfahrens sieht vor, ein Führen der Robotervorrichtung entlang der festgelegten Bahnkurve basierend auf einem kinematischen Modell der Robotervorrichtung zu simulieren. A further embodiment of the inventive method to simulate guiding the robotic device along the defined trajectory based on a kinematic model of the robot apparatus. Es werden erste Punkte der Bahnkurve bestimmt, die die Robotervorrichtung beim simulierten Führen zu vorbestimmten Zeitpunkten erreicht. Are determined first points of the trajectory that reaches the robot apparatus performing the simulated at predetermined times. Entlang der Bahnkurve werden an den Koordinaten der ersten Punkte Zeitmarkierungen projiziert. Along the trajectory time markings are projected to the coordinates of the first points. Die vorbestimmten Zeitpunkte sind vorzugsweise äquidistant verteilt. The predetermined times are preferably equidistantly distributed. Somit gibt der Abstand zwischen zwei Zeitmarkierungen ein Maß für die Geschwindigkeit des Roboters an, mit welcher der Manipulator zumindest in der Simulation entlang der Bahnkurve geführt wird. Thus, the distance between two time markers provides a measure of the speed of the robot with which the manipulator is guided at least in the simulation along the trajectory curve. Hierdurch erhält der Bediener die Möglichkeit, gegebenenfalls in die Robotersteuerung einzugreifen, um die Geschwindigkeit entlang einzelner Abschnitte gezielt anzupassen, damit der Manipulator mit gleichbleibender Geschwindigkeit entlang der Bahnkurve geführt wird. In this way, the operator is given the opportunity, if necessary intervene in the robot controller to adjust the speed along individual portions selectively so that the manipulator with a constant velocity along the trajectory is performed. In einer weiteren Ausgestaltung wird ebenfalls das Führen der Robotervorrichtung entlang der festgelegten Bahnkurve basierend auf einem kinematischen Modell der Robotervorrichtung simuliert. In a further embodiment, guiding the robotic device along the predetermined path curve is also simulated based on a kinematic model of the robot apparatus. Hierbei werden die zweiten Punkte der Bahnkurve bestimmt, für die die Robotervorrichtung Posen einnehmen muss, welche zur Kollision mit dem Werkstück und/oder einer Arbeitsumgebung führen. Here, the second points of the trajectory are determined for the robotic device poses must take, leading to the collision with the workpiece and / or a work environment. Ferner werden zweite Punkte bestimmt, für welche das Simulieren ergibt, dass die Posen für die Robotereinrichtung uneinnehmbar sind. Further, second points are determined for which the simulation shows that the float for the robot means are impregnable. Kollisionsmarkierungen werden dann entlang der projizierten Bahnkurve an den Koordinaten der zweiten Punkte projiziert. Collision marks are then projected along the projected trajectory of the coordinates of the second points. Hierdurch erhält der Bediener einen unmittelbaren Hinweis darauf, dass die von ihm angestrebte Bahnkurve nicht realisierbar ist. In this way, the operator receives an immediate indication that the target of his trajectory is not feasible. Gemäß einer weiteren Ausgestaltung wird die Bahnkurve mittels einer mobilen Projektionseinrichtung projiziert, die nahe oder anstelle eines Manipulators an der Robotervorrichtung fest oder lösbar angeordnet ist. According to a further embodiment, the trajectory is projected by means of a mobile projection device which is arranged close to or in place of a manipulator on the robotic device fixedly or detachably. Dies lässt eine flexiblere Anordnung der Projektionseinrichtung zu. This allows for a more flexible arrangement of the projection device. Ferner nimmt dabei die Robotervorrichtung bereits eine Pose an, die zumindest grob den später während dem Betrieb eingenommenen Posen entspricht. Further, while the robot apparatus is already taking a pose that at least roughly corresponds to the later occupied during operation poses. Die zu bearbeitende Oberfläche kann in mehrere Segmente aufgeteilt werden und für jedes Segment wird die mobile Projektionseinrichtung durch die Robotervorrichtung automatisch in eine Pose geführt, von welcher aus die mobile Projektionseinrichtung auf jeden Punkt des ausgewählten Segments projizieren kann und die Projektionseinrichtung bei dieser Pose einen geringen Abstand zur Oberfläche aufweist, bevor durch die Zeigereinrichtung und deren Erfassung eine Mehrzahl von Stützpunkten in dem Segment der Oberfläche festgelegt werden. The surface to be processed can be divided into several segments, and the mobile projection device is guided by the robotic device automatically in a pose, from which the portable projection device can be projected onto each point of the selected segment and the projection device at this pose a small distance for each segment has to the surface before being defined by interpolation points in the segment of the surface by the pointing device and the detecting a plurality. Dieses Verfahren ermöglicht das Aufteilen der Darstellung einer Bahnkurve in mehrere Abschnitte. This method allows dividing the representation of a trajectory in a plurality of sections. Bei sehr großen und/oder komplex strukturierten Werkstücken ist unter Umständen eine Projektion von einer einzigen Pose oder einem stationär angeordneten Projektor nicht mehr möglich. For very large and / or complex structured workpieces, under certain circumstances a projection of a single pose or a stationarily arranged projector is no longer possible. Zudem wird durch den kleineren abzudeckenden Winkelbereich des Projektors eine höhere Auflösung und Darstellungsgenauigkeit bei der Projektion ermöglicht. In addition, a higher resolution and accuracy of representation is made possible in the projection covered by the smaller angle range of the projector. Eine weitere Ausgestaltung sieht vor, dass zuerst mit einer stationären Projektionseinrichtung Orientierungspunkte auf die zu bearbeitende Oberfläche projiziert werden. Another embodiment provides that first landmarks are projected onto the surface to be processed with a stationary projection device. Die mobile Projektionseinrichtung wird zusammen mit einer optischen Erfassungseinrichtung mittels der Robotervorrichtung automatisch in eine Pose geführt, von welcher aus die optische Erfassungseinrichtung mindestens drei Orientierungspunkte erfasst. The portable projection device is guided together with an optical detection device by means of the robotic device automatically in a pose, from which the optical detection means detects at least three reference points. Der Bediener kann zuvor die Oberfläche in Segmente unterteilen und deren Abmessungen durch drei oder mehr Orientierungspunkte festlegen. The operator may previously divide the surface into segments and define their dimensions by three or more reference points. Die Robotervorrichtung kann dann anhand von jeweils drei projizierten Orientierungspunkten die mobile Projektionseinrichtung in die gewünschten Posen verfahren. The robotic device may then process based on each of the three projected orientation points, the mobile projection device in the desired poses. Ferner ist es möglich, anhand der drei Orientierungspunkte eine Kalibrierung der optischen Erfassungseinrichtung basierend auf einem Unterschied zwischen den festgelegten Koordinaten der Orientierungspunkte und den durch die optische Erfassungseinrichtung erfassten Koordinaten der projizierten Orientierungspunkte durchzuführen. Further, it is possible to perform by the three reference points, calibration of the optical detecting means based on a difference between the specified coordinates of the reference points and detected by the optical detection device coordinates of the projected points of reference. Hierbei kann auch eine Anpassung des Robotermodells erfolgen. In this case, an adaptation of the robot model can be. In einer anderen Ausgestaltung werden eine Mehrzahl von reflektierenden oder selbstleuchtenden Orientierungsmarkern auf der zu bearbeitenden Oberfläche an bekannten Koordinaten angeordnet. In another embodiment, a plurality are arranged of reflective or self-luminous orientation markers on the surface to be machined at known coordinates. Die optische Erfassungseinrichtung erfasst die Koordinaten der Orientierungsmarker. The optical detection means detects the coordinates of the orientation marker. Eine Kalibrierung der optischen Erfassungseinrichtung und/oder der Projektionseinrichtung und/oder des Robotermodells erfolgt basierend auf einem Unterschied zwischen den bekannten Koordinaten der Orientierungsmarker und den erfassten Koordinaten der Orientierungsmarker. A calibration of the optical detection device and / or the projection device and / or of the robot model is based on a difference between the known coordinates of the orientation marker and the detected coordinates of the orientation marker. Die reflektierenden Marker können durch einen Lasertracker beleuchtet werden, der an der Erfassungseinrichtung oder der Projektionseinrichtung angeordnet ist. The reflective markers can be illuminated by a laser tracker, which is arranged on the sensing device or the projection device. Ferner kann eine zusätzliche optische Erfassungseinrichtung zum Erfassen der Koordinaten der Orientierungsmarker bereitgestellt werden. Furthermore, an additional optical detection means for detecting the coordinates of the orientation marker can be provided. Die Anordnung der Orientierungsmarker kann mit einer kalibrierten Vermessungseinrichtung ausgemessen werden, um die Koordinaten der Orientierungsmarker zu bestimmen. The arrangement of the orientation marker can be measured with a calibrated measuring device to determine the coordinates of the orientation marker. In einer Erweiterung werden die Koordinaten der Stützpunkte mit sechs Koordinaten zur Beschreibung der räumlichen Lage und der Orientierung festgelegt. In an extension of the coordinates of the reference points with six coordinate for describing the spatial position and orientation are determined. Die Orientierung wird unter anderem für die Ausrichtung des Manipulators bezüglich der zu bearbeitenden Oberfläche in manchen Anwendungen benötigt. The orientation is needed, inter alia, for the orientation of the manipulator with respect to the surface to be processed in some applications. Der Verlauf der Orientierung entlang der Bahnkurve kann durch automatische Interpolation ermittelt werden. The course of the orientation along the trajectory can be determined by automatic interpolation. Hierbei erfolgt zweckmäßigerweise eine Interpolation basierend auf den drei Koordinaten, zB Winkelkoordinaten, die die Orientierung festlegen. Expediently as interpolation is performed based on the three coordinates, such as angular coordinates that define the orientation. In einer Ausgestaltung werden richtungsangebende Markierungen entsprechend dem Orientierungsverlauf entlang der Bahnkurve auf die Oberfläche projiziert. In one embodiment, direction indicating marks are projected according to the orientation pattern along the trajectory on the surface. Die erfindungsgemäße Vorrichtung weist eine Zeigereinrichtung, eine Verfolgungseinrichtung zum Erfassen der Koordinaten und/oder der Orientierung der Zeigereinrichtung, eine Datenverarbeitungseinrichtung zum automatischen Interpolieren von Wegstrecken zwischen jeweils zwei benachbarten Stützpunkten zum Festlegen der Bahnkurve und eine Projektionseinrichtung zum Projizieren der Bahnkurve auf die Oberfläche auf. The inventive apparatus includes a pointing device, a tracking device for detecting the coordinates and / or orientation of the pointing device, a data processing device for automatically interpolating paths between any two adjacent support points for defining the trajectory, and a projection means for projecting the trajectory on the surface. Die Projektionseinrichtung kann mindestens eine Laserlichtquelle und eine Ablenkeinrichtung zum Richten mindestens eines Laserlichtstrahls aufweisen. The projection means may comprise at least one laser light source and deflecting means for directing at least one laser light beam. Vorzugsweise weist sie mehrere Laserlichtquellen zum Darstellen verschiedener Farben auf. Preferably, it comprises a plurality of laser light sources to represent various colors. Die Ablenkeinrichtungen können rein mechanisch und/oder optomechanisch realisiert sein. The deflection directions may be implemented in a purely mechanical and / or opto-mechanical. In einer Ausgestaltung wird eine optische Erfassungseinrichtung zum Erfassen einer projizierten Bahnkurve bereitgestellt. In one embodiment, an optical detecting means is provided for detecting a projected trajectory. Die Projektionseinrichtung und/oder die optische Erfassungseinrichtung können stationär angeordnet sein. The projection device and / or the optical detection means may be arranged stationarily. Die Projektionseinrichtung und/oder die optische Erfassungseinrichtung können ebenso fest und/oder lösbar an der Robotervorrichtung angeordnet sein. The projection device and / or the optical detection means can be arranged on the robot apparatus as firmly and / or detachably. 2 2 : ein Flussdiagramm eines beispielhaften Verfahrens zu : To a flowchart of an exemplary method 1 1 , . 4 4 : ein Flussdiagramm eines weiteren beispielhaften Verfahrens zu : To a flowchart of another exemplary method 3 3 , . 5 5 : eine Seitenansicht zu Is a side view to 4 4 , . 8 8th : ein Flussdiagramm eines beispielhaften Verfahrens zu : To a flowchart of an exemplary method 7 7 , . 10 10 : eine Illustration zu dem beispielhaften Verfahrens von : An illustration to the exemplary method of 9 9 , . 12 12 : eine Illustration einer beispielhaften Ausgestaltung der vorhergehenden Verfahren. An illustration of an exemplary embodiment of the foregoing methods. Gleiche Bezugszeichen beschreiben gleiche oder funktionsgleiche Elemente. Like reference numerals designate like or functionally equivalent elements. In In 1 1 ist schematisch eine Vorrichtung zum Einrichten einer Bahnkurve K eines Roboters is shown schematically an apparatus for setting a trajectory of a robot K 2 2 gemäß einem Ausführungsbeispiel dargestellt. illustrated in accordance with one embodiment. Ein Werkstück A workpiece 1 1 mit einer ebenen oder gekrümmten Oberfläche O soll mit dem Roboter with a flat or curved surface O to the robot 2 2 und dem an ihm befestigten Manipulator and attached to it Manipulator 4 4 bearbeitet werden. to be edited. Eine Robotersteuerung A robot control 3 3 steuert hierzu den Roboter this controls the robot 2 2 gemäß einem noch zu bestimmenden Programmablauf an, so dass der Manipulator according to a yet to be determined program sequence, so that the manipulator 4 4 entlang einer gewünschten Bahnkurve geführt wird. is guided along a desired trajectory. Der Manipulator the manipulator 4 4 steht hierbei für eines oder mehrere bekannte Werkzeuge zum Schneiden, Kleben, Schweißen etc. Der in stands for one or more known tools for cutting, gluing, welding, etc. The in 1 1 dargestellte Roboter robots shown 2 2 ist exemplarisch für eine Vielzahl von verschiedenen Vorrichtungen, welche zum Führen des Manipulators is exemplary of a variety of different devices, which for guiding the manipulator 4 4 geeignet sind. are suitable. In dem dargestellten Beispiel soll der Manipulator In the example shown, the manipulator should 4 4 entlang der Kurve K über die Oberfläche O des Werkstücks along the curve K beyond the surface of the workpiece O 1 1 geführt werden. be performed. Die Bahnkurve K, wie auch andere Bahnkurven, lassen sich durch eine Mehrzahl von Stützpunkten P1, P2, ... festgelegen. The trajectory K, as well as other trajectories, can be, firmly located by a plurality of supporting points P1, P2 .... Geeignete Interpolationsalgorithmen oder Interpolationsfunktionen beschreiben dann die Wegstrecken zwischen zwei benachbarten Stützpunkten P1, P2. Suitable interpolation or interpolation then describe the distances between two adjacent supporting points P1, P2. Eine komplexe Bahnkurve K mit einer Vielzahl an verschiedenen Krümmungen benötigt eine größere Anzahl von Stützwerten P1, P2. A complex trajectory K with a variety of different curvatures require a greater number of interpolation points P1, P2. Das nachfolgend beschriebene Verfahren befasst sich vorwiegend mit der Festlegung dieser Stützpunkte P1, P2. The method described below is primarily concerned with the determination of these points P1, P2. Einem Bediener wird eine Zeigeeinrichtung An operator is a pointing device 10 10 , zB ein Stift , For example a pin 10 10 mit einer Spitze with a tip 12 12 , zur Verfügung gestellt. , made available. Eine Verfolgungseinrichtung A tracking device 11 11 oder Trackingeinrichtung erfasst die Koordinaten und gegebenenfalls auch die Orientierung des Stifts or tracking device detects the coordinates and optionally also the orientation of the pin 10 10 im Raum. in the room. Der Stift The pencil 10 10 weist dazu Markierungen auf, welche durch eine bildauflösende Einrichtung, zB eine Kamera, in einem Bild aufgenommen werden. purpose has markings which are recorded in an image by an image resolving device, for example a camera. Durch Vergleich der Position der Markierungen in dem Bild mit den realen Abständen der Markierungen auf dem Stift By comparing the position of the markings in the image with the real distances of the marks on the pin 10 10 wird die Position und Orientierung des Stifts is the position and orientation of the pin 10 10 ermittelt. determined. In In 2 2 ist ein Flussdiagramm dargestellt, anhand dessen die Festlegung der Stützpunkte P1, P2, ... durch einen Bediener erläutert wird. a flow diagram is shown, based on which the determination of the points P1, P2, ... will be explained by an operator. Zuerst wird das Werkstück First, the workpiece is 1 1 mit der zu bearbeitenden Oberfläche O im Arbeitsbereich des Roboters with the surface to be machined in the work area of ​​the robot O 2 2 angeordnet (S10). disposed (S10). Der Bediener berührt mit dem Stift The operator touches with the pen 10 10 die Oberfläche O an den Punkten, welche er für geeignete Stützpunkte P1, P2, ... hält (S11). the surface O to the points which he considers appropriate points P1, P2 ... (S11). Während der Bediener den Stift While the operator the pin 10 10 durch den Raum bewegt, erfasst die Verfolgungseinrichtung moves through space, detects the tracking device 11 11 die Koordinaten und gegebenenfalls die Orientierung des Stifts the coordinates and optionally, the orientation of the pin 10 10 , wie zuvor beschrieben (S12). As previously described (S12). Durch eine Betätigungseinrichtung, zB einen Taster an dem Stift By an actuator, for example a button on the pen 10 10 , signalisiert der Bediener, dass der an der Oberfläche O berührte Punkt als Stützpunkt P1, P2, ... in eine Stützwerttabelle aufgenommen werden soll (S13). , Signals the operator that the touched point on the surface of O as a supporting point P1, P2, to be included in a point table, ... (S13). Vorteilhafterweise kann die Betätigungseinrichtung in dem Stift Advantageously, the actuating means may in the pin 10 10 integriert sein und durch einen Andruck der Spitze be integrated, and by a pressure of the tip 12 12 gegen die Oberfläche betätigt werden. be actuated against the surface. Die von der Verfolgungseinrichtung By the tracking device 11 11 erfassten Koordinaten des Stifts detected coordinates of the pen 10 10 werden als Positionssignal be as a position signal 110 110 an eine Datenverarbeitungseinrichtung to a data processing device 20 20 weitergeleitet. forwarded. Diese weist einen Speicher auf, um die einzelnen Stützpunkte P1, P2, ... und deren Koordinaten in einer Stützwerttabelle abzuspeichern. This has a memory to memorize the individual points P1, P2, ... and their coordinates in a reference value table. Eine Funktionseinheit der Datenverarbeitungseinrichtung A functional unit of the data processing device 20 20 bestimmt mittels Interpolation eine Bahnkurve K basierend auf den Stützpunkten P1, P2 (S14). determined by interpolation a trajectory K based on the control points P1, P2 (S14). Die Interpolation ermittelt die jeweiligen Wegstrecken zwischen zwei benachbarten Stützpunkten P1, P2. The interpolation determines the respective distances between two adjacent supporting points P1, P2. Die angewandten Interpolationsfunktionen können eine lineare Interpolationsfunktion zwischen den zwei benachbarten Stützpunkten P1, P2, eine polynomiale Interpolationsfunktion durch drei oder mehr Stützpunkte P1, P2, ... usw. enthalten. The interpolation used may have a linear interpolation between the two adjacent supporting points P1, P2, contain a polynomial interpolation by three or more vertices P1, P2, ... etc. Die Datenverarbeitungseinrichtung The data processing device 20 20 übermittelt ein Ansteuersignal transmits a drive signal 120 120 an einen Projektor to a projector 15 15 , so dass der Projektor So that the projector 15 15 die festgelegte Kurve K auf die Oberfläche O des Werkstücks the predetermined curve K to the surface of the workpiece O 1 1 projiziert (S15). projecting (S15). Der Bediener sieht somit unmittelbar die Form der von ihm festgelegten Bahnkurve K. Entlang dieser Bahnkurve K führt dann der Roboter Thus, the operator can see directly the shape of the set by him trajectory K. Along this trajectory K then the robot performs 2 2 während dem Betrieb den über die Oberfläche O. Er erhält somit nicht nur eine Rückkopplung, welche Stützpunkte angefahren werden, sondern auch die Wegstrecken dazwischen. during operation over the surface O. It thus not only receive feedback which points are approached, but also between the distances. Weicht die dargestellte Bahnkurve K von einer gewünschten Bahnkurve ab, kann der Bediener durch Hinzufügen, Löschen oder Verschieben von Stützpunkten P1, P2, ... die Bahnkurve K anpassen. Softens the illustrated trajectory K of a desired trajectory from the operator can adjust the trajectory K by adding, deleting or moving bases P1, P2, .... Vorteilhafterweise projiziert der Projektor Advantageously, the projector projected 15 15 gesonderte Markierungen an den Koordinaten der Stützpunkte P1, P2, ... auf die Oberfläche O, zB Symbole, Kreuze, Kreise. separate markers at the coordinates of the points P1, P2, ... to the surface of O, for example, symbols, crosses, circles. Nachdem eine geeignete Bahnkurve K festgelegt ist, wird die sie an die Robotersteuerung After an appropriate path curve K is determined that it is to the robot controller 3 3 übermittelt. transmitted. Hierbei sind gegebenenfalls Koordinatentransformationen notwendig, die die Koordinaten der Stützpunkte und sonstiger Bahnpunkte von einem Koordinatensystem der Verfolgungseinrichtung Here, coordinate transformations are given if necessary, the coordinates of the points and other path points of a coordinate system of the tracking device 11 11 und des Projektors and the projector 15 15 in das Roboterkoordinatensystem umrechnen. Convert into the robot coordinate system. Die Wegstrecken zwischen den einzelnen Stützpunkten P1, P2 können von der Datenverarbeitungseinrichtung The distances between the breakpoints P1, P2, of the data processing device 20 20 als einzelne Bahnpunkte in ausreichender Dichte an die Robotersteuerung as individual path points in sufficient density to the robot controller 3 3 übermittelt werden. are transmitted. Falls die Robotersteuerung über ein geeignetes kinematisches Robotermodell verfügt, können ihr auch die entsprechenden Interpolationsfunktionen zu den einzelnen Wegstrecken übermittelt werden. If the robot controller through a suitable kinematic model of the robot has, it can be transmitted to the individual paths, the corresponding interpolation functions. Die Robotersteuerung The robot controller 3 3 berechnet dann selbst die Wegstrecke zwischen den Stützpunkten P1, P2. then calculates the distance itself between the supporting points P1, P2. In dem in Where in 2 2 beschriebenen Verfahren werden zuerst Stützpunkte festgelegt, bevor eine Bahnkurve projiziert wird. Methods described are first determined bases before a trajectory is projected. Häufig sind jedoch bereits eine Bahnkurve oder Stützpunkte vorab bekannt. However, a trajectory or bases are already known in advance often. Dies ist zum Beispiel der Fall, wenn eine Änderung einer Werkstückserie vorgenommen wird und diese mit dem gleichen Roboter bearbeitet werden soll. This is the case for example, when a change in a series of workpieces is carried out and this is to be processed with the same robot. Hierbei kann der Roboter weitgehend entlang einer ursprünglichen Bahnkurve geführt werden, die für die ursprüngliche Werkstückserie geeignet war. The robot can be largely guided along an initial trajectory, which was suitable for the original series of workpieces. Hierbei ist es nun zweckmäßig die ursprüngliche Bahnkurve auf das neue Werkstück zunächst zu projizieren, damit der Bediener die Abschnitte der ursprünglichen Bahnkurve erkennt, die geändert werden müssen. Here, it is now appropriate to project the original trajectory to the new work first so that the operator recognizes the sections of the original trajectory that must be changed. In diesen Abschnitten passt er die Stützpunkte an oder fügt neue Stützpunkte hinzu. In these sections, he adjusts the bases or adding new bases. Die einzelnen Verfahrensschritte können mehrfach iterativ wiederholt werden, bis die Bahnkurve optimal angepasst ist. The individual process steps can be repeated several times iteratively until the trajectory is properly adjusted. In In 3 3 ist schematisch ein weiteres Ausführungsbeispiel und in schematically another embodiment and in 4 4 ein zugehöriges Verfahren als Flussdiagramm dargestellt. an associated method as a flow chart. Auf der Oberfläche O des Werkstücks O on the surface of the workpiece 1 1 legt ein Bediener mehrere Stützpunkte P1, P2, ... mittels des Stifts the operator can place more vertices P1, P2, ... by means of the pin 10 10 in der zuvor beschriebenen Weise fest (S21). in the manner described previously determined (S21). Die Datenverarbeitungseinrichtung The data processing device 20 20 berechnet die durch die Stützpunkte P1, P2, ... und die vorbestimmten Interpolationsfunktionen die Bahnkurve K (S22). calculated by the supporting points P1, P2, ... and the predetermined interpolation the trajectory K (S22). Die Bahnkurve K bzw. entsprechende Steuerbefehle The trajectory K and corresponding control commands 120 120 werden an den Projektor be to the projector 15 15 übermittelt. transmitted. Dieser projiziert die Bahnkurve K in die Richtung der Oberfläche O (S23). This projects the trajectory K in the direction of the surface O (S23). Diese wesentlichen Schritte stimmen mit den Verfahrensschritten des zuvor beschriebenen Ausführungsbeispiels überein. These basic steps are the same as the steps of the embodiment described above. Die Stützpunkte P1, P2, ... werden mit drei Koordinaten entsprechend dem dreidimensionalen Raum durch die Verfolgungseinrichtung The points P1, P2, ... are three coordinates corresponding to the three-dimensional space by the tracking device 11 11 erfasst. detected. Für die Bahnpunkte auf den interpolierten Wegstrecken zwischen den Stützpunkten P1, P2, ... werden ebenfalls drei Raumkoordinaten bestimmt. For the path points on the interpolated distances between the supporting points P1, P2, ... three spatial coordinates are also determined. Die Interpolationsfunktion hat jedoch a priori keine Kenntnisse über die Krümmungen oder sonstigen Oberflächenbeschaffenheiten der Oberfläche O zwischen den Stützpunkten P4, P5. The interpolation function, however, has no a priori knowledge of the bends or other surface properties of the surface O between the support points P4, P5. In In 5 5 ist das Werkstück the workpiece 1 1 in einer seitlichen Querschnittsansicht zwischen den Stützpunkten P4, P5 zugehörig zu der Draufsicht von in a lateral cross-sectional view between the support points P4, P5 belonging to the plan view of 3 3 dargestellt. shown. Es ist beispielhafterweise eine lineare Interpolation in der vertikalen Richtung, dh z-Richtung, zwischen den benachbarten Stützpunkten P4 und P5 verwendet. It is by way of example, a linear interpolation in the vertical direction, ie, the z-direction, using P4 and P5 between the adjacent bases. Dies führt zu der in This results in 5 5 dargestellten geradlinigen Bahnkurve K1. rectilinear trajectory K1 shown. Zwischen den Stützpunkten P4, P5 ist die Oberfläche O nach oben gewölbt. Between the support points P4, P5, the surface O is arched upwards. Die interpolierten Bahnpunkte I1 auf der Wegstrecke zwischen den Stützpunkten P4 und P5 liegen somit nicht auf der Oberfläche O. The interpolated path points I1 on the distance between the support points P4 and P5 are not so on the surface O.
Entsprechend kann und soll der Manipulator Accordingly, and to the manipulator 4 4 diese interpolierten Bahnpunkte I1 nicht anfahren, damit eine möglicherweise irreparable Schädigung des Manipulators this interpolated path points I1 not start, so that a possibly irreparable damage to the manipulator 4 4 und/oder des Werkstücks and / or the workpiece 1 1 vermieden wird. is avoided. Für die Projektion der Bahnkurve K1 werden die dreidimensionalen Koordinaten der Stützpunkte P4, P5 und der interpolierten Bahnpunkte I1 in Paare von Winkelkoordinaten umgerechnet. For the projection of the path curve K1, the three-dimensional coordinates of the points P4, P5, and the interpolated path points I1 in pairs of angular coordinates are converted. Bei der Projektion mittels der Lichtstrahlen In the projection by the light beams 115 115 ergibt sich eine projizierte Bahnkurve K'1 auf der Oberfläche O. Ein interpolierter Bahnpunkt I1 wird auf einen projizierten Bahnpunkt R1 abgebildet. results in a projected trajectory K'1 on the surface O. An interpolated path point I1 is mapped onto a projected point on the path R1. Die projizierte Bahnkurve K'1 wird mittels Triangulation dreidimensional erfasst (S24). The projected trajectory K'1 is three-dimensionally detected by means of triangulation (S24). Die Triangulation kann zB durch zwei zueinander beabstandete aufgestellte Kameras for example, the triangulation can be prepared by two spaced-apart cameras established 50 50 , . 51 51 erfolgen. respectively. Eine entsprechende Datenverarbeitungseinrichtung für die Triangulation A corresponding data processing device for triangulation 60 60 berechnet aus den stereografisch aufgenommenen Bildern den dreidimensionalen Verlauf der projizierten Bahnkurve K'1. calculated from the stereographic captured images the three-dimensional profile of the projected path line K'1. Die entsprechenden Datenpunkte werden an die Datenverarbeitungseinrichtung The corresponding data points in the data processing device 20 20 weitergeleitet. forwarded. Diese bestimmt die Abschnitte, in welchen die projizierte Bahnkurve K'1 von der durch Interpolation festgelegten Bahnkurve K1 abweichen (S25). This determines the portions in which the projected trajectory K'1 deviate from the predetermined trajectory by interpolation K1 (S25). Der Projektor wird nun durch Steuerbefehle The projector is now controlled by control commands 120 120 angewiesen, diese abweichenden Abschnitte der projizierten Bahnkurve K'1 in einer anderen Farbe zu projizieren als die übrigen Abschnitte. instructed K'1 to project these different portions of the projected path line in a different color than the remaining portions. Der Bediener erhält auf diese Weise eine sofortige Rückmeldung, dass in diesen Bereichen eine Anpassung der Interpolationsfunktionen und/oder zusätzliche Stützpunkte P4, P5, ... für die Festlegung der Bahnkurve K'1 notwendig sind (S26). The operator receives immediate feedback in this way that in these areas to adapt the interpolation and / or additional points P4, P5, ... for determining the trajectory K'1 necessary (S26). Aus der Abweichung der projizierten Bahnkurve von der festgelegten interpolierten Bahnkurve K1 kann die Krümmung der Oberfläche O bestimmt werden. From the deviation of the projected path line of the fixed interpolated trajectory K1, the curvature of the surface O can be determined. Die so bestimmte Krümmung kann verwendet werden, eine geeignetere Interpolationsfunktion zum Festlegen der Wegstrecken zwischen den Stützpunkten P4, P5 zu verwenden. The determined curvature can be used to use a more appropriate interpolation function to set the distances between the support points P4, P5. Insbesondere kann eine Interpolationsfunktion verwendet werden, die die gleiche Krümmung aufweist. In particular, an interpolation function can be used having the same curvature. Eine Anpassung kann automatisch oder auf Nachfrage durch den Bediener erfolgen. An adjustment can be done automatically or on demand by the operator. Dies ist insbesondere dann vorteilhaft, wenn ein neues Werkstück oder eine Werkstücksserie nur geringe Modifikationen oder Abweichungen zu einem vorhergehenden Werkstück aufweist. This is especially advantageous if a new workpiece or a workpiece series has only slight modifications or variations to a preceding workpiece. Hierdurch wird der Aufwand für die Neuprogrammierung und/oder Einrichtung des Roboters Thereby, the cost of reprogramming and / or device of the robot 2 2 auf ein vertretbares Maß reduziert. reduced to an acceptable level. Anstelle von zwei Kameras Instead of two cameras 50 50 , . 51 51 sind auch andere Triangulationseinrichtungen verwendbar. Other Triangulationseinrichtungen be used. Durch eine Zeit-aufgelöste Verfolgung der Projektion der Bahnkurve K1 kann ebenfalls eine Bestimmung der Krümmung der Oberfläche O erreicht werden. By time-resolved tracking the projection of the trajectory K1 determination of the curvature of the surface O can also be achieved. Hierbei müssen geeignete Synchronisationseinrichtungen zwischen einem zeitauflösenden Bilderfassungssystem und dem Projektor Here, have appropriate synchronization means between a time-resolved imaging system and projector 15 15 bereitgestellt werden. to be provided. Ferner ist ein Projektor notwendig, der den Lichtstrahl Furthermore, a projector is needed, the light beam to 115 115 mit einer gleichbleibenden Winkelgeschwindigkeit über die Oberfläche O ablenken kann. can deflect with a constant angular velocity over the surface O.
Eine weitere Vorrichtung projiziert bei einer festgestellten Abweichung zwischen der interpolierten Bahnkurve K1 und der projizierten Bahnkurve K'1 ein Gitter. Another apparatus projects a grid at a determined deviation between the interpolated trajectory K1 and K'1 the projected trajectory. Die Gitterlinien werden unter zueinander äquidistant beabstandeten Winkeln projiziert. The grid lines are projected under each other equidistantly spaced angles. Trifft ein solch projiziertes Gitter auf eine planare Oberfläche, ergibt sich ein Gitter mit äquidistant beabstandeten Linien. Meets such a projected grating on a planar surface, there is a grating with equidistantly spaced lines. Auf einer gekrümmten Oberfläche ist das projizierte Gitter verzerrt. On a curved surface of the projected grid is distorted. Aus der Verzerrung lässt sich in eindeutigerWeise die Krümmung der Oberfläche O bestimmen. From the distortion of the curvature of the surface O can be determined in clear legally. Hierfür ist eine entsprechende Ansteuerungseinrichtung für den Projektor This is a corresponding control device for the projector 15 15 zum Generieren des Gitters und eine einfache bildauflösende Einrichtung notwendig. necessary for generating the grid and a simple image resolution setting. In In 6 6 ist ein weiteres Ausführungsbeispiel schematisch dargestellt. A further embodiment is shown schematically. Der Projektor The projector 15a 15a ist an dem Roboter is on the robot 2 2 angebracht. appropriate. Hierbei ist eine räumliche Nähe zu der Anordnung des Manipulators Here, a spatial proximity to the arrangement of the manipulator 4 4 vorteilhaft. advantageous. Gegebenenfalls können sowohl der Projektor Optionally, both the projector 15a 15a als auch der Manipulator and the manipulator 4 4 gleichzeitig an dem Roboter angeordnet sein. be located simultaneously on the robot. Es kann ebenso vorteilhaft sein, den Projektor It may also be advantageous to the projector 15a 15a lösbar an dem Roboter detachably mounted on the robot 2 2 anzuordnen, um ihn zur Einrichtung für andere Roboter ebenfalls verwenden zu können. to arrange to also use it to set up for other robots. Die Erfassung der Stützpunkte P1, P2, ... und die Festlegung der Bahnkurve K erfolgt wie zuvor beschrieben mittels des Stifts The detection of the reference points P1, P2, ... and the determination of the path curve K is performed as previously described by means of the pin 10 10 , der Verfolgungseinrichtung , The tracking device 11 11 und der Datenverarbeitungseinrichtung and the data processing device 20a 20a . 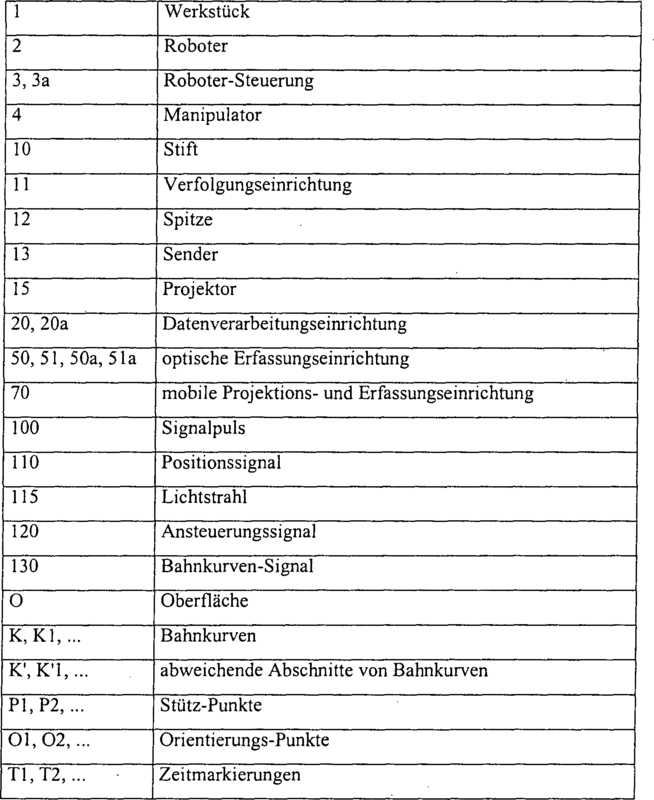 , Eine Übertragung der Steuerungsdaten von der Datenverarbeitungseinrichtung A transfer of control data from the data processing device 20a 20a an den Projektor to the projector 15a 15a kann mittels Funksignalen can by means of radio signals 120a 120a oder über die Robotersteuerung or via the robot controller 3a 3a erfolgen. respectively. Vor der Projektion der Bahnkurve K wird vorzugsweise der Roboter Before the projection of the trajectory of the robot is preferably K 2 2 in eine Pose verfahren, in welcher ein Abstand zwischen dem Projektor A method in a pose in which a distance between the projector 15a 15a und der Oberfläche O möglichst gering ist, andererseits aber der Projektor die gesamte Bahnkurve K projizieren kann. and the surface O is as low as possible, but on the other hand, the projector can project the entire trajectory K. Der Abstand und die Positionierung sind abhängig von der Oberflächenform und dem maximalen Winkelbereich, den der Projektor The spacing and positioning are dependent on the surface shape and the maximum angle range, the projector 15a 15a ausleuchten kann. can illuminate. Bei sehr verwinkelten Werkstücken oder Werkstücken mit Hohlräumen kann die Projektion durch einen einzigen Projektor At very narrow workpieces or workpieces with voids, the projection can be obtained by a single projector 15 15 nur bedingt von einer festen Position aus erfolgen. only caused from a fixed position. Hierbei erweist es sich insbesondere als vorteilhaft, wenn der Projektor It proves to be particularly advantageous when the projector 15a 15a an dem Roboter on the robot 2 2 befestigt und an verschiedene Positionen bewegbar ist. is fixed and is movable to different positions. Der Projektor The projector 15a 15a kann in einem Modul may be in a module 70 70 integriert sein, das auch eine optische Erfassungseinrichtung zur Triangulation, zB zwei Kameras be integrated, which is also an optical detection device for triangulation, for example, two cameras 50a 50a , . 51a 51a aufweist. having. Das Modul The module 70 70 ist vorteilhafterweise als Einheit integriert. is advantageously integrated as a unit. Hierdurch ergibt sich ein dauerhafter Bezug zwischen den Koordinatensystemen der Projektionseinrichtung This results in a permanent relationship between the coordinate systems of the projection device 15a 15a und den optischen Erfassungseinrichtungen and the optical detection means 50a 50a , . 51a 51a . , Ferner kann das Modul mit einem Verbindungsstück versehen sein, das eine einfache Anbringung und Entfernung von dem Roboter Further, the module may be provided with a connecting piece, the easy attachment and removal of the robot 2 2 ermöglicht. allows. Die Verfolgungseinrichtung The tracking device 11 11 kann in dem Modul may in the module 70 70 integriert sein. be integrated. Hierdurch sind die Koordinatensysteme der Projektionseinrichtung In this way, the coordinate systems of the projection device 15a 15a , der Erfassungseinrichtung , The detector 50a 50a , . 51a 51a und der Verfolgungseinrichtung and the tracking device 11 11 zueinander in fester Beziehung. to each other in a fixed relationship. Zweckmäßiger Weise wird eine einmalige Kalibration durchgeführt und die Koordinatensysteme auf ein einziges Koordinatensystem abgebildet. Conveniently, conducted a one-time calibration and displayed, the coordinate systems on a single coordinate system. Zusammen mit den Together with the 7 7 und and 8 8th wird ein weiteres Ausführungsbeispiel erläutert. will be explained a further embodiment. Dem Bediener ist wie zuvor ein Stift The operator is, as before, a pin 10 10 bereitgestellt, dessen Position durch die Verfolgungseinrichtung provided, whose position by the tracking device 11 11 erfasst wird. is detected. Bei einem sehr großen oder komplex geformten Werkstück In a very large or complex shaped workpiece 1a 1a ist es zweckmäßig, die Oberfläche O in mehrere Segmente A, B zu unterteilen (S30). it is expedient to subdivide the surface O in a plurality of segments A, B (S30). In jedem dieser Segmente markiert der Bediener mittels des Stifts mehrere Orientierungspunkte O1, O2, ... (S31). In each of these segments, the operator marked by means of the pin several landmarks O1, O2, ... (S31). Deren Koordinaten werden über eine Datenverarbeitungseinrichtung Whose coordinates are a data processing device 20 20 an eine stationäre Projektionseinrichtung to a stationary projection device 15b 15b weitergeleitet. forwarded. Diese Projektionseinrichtung projiziert nun Markierungen auf die Oberfläche O entsprechend den Orientierungspunkten O1, O2, ... (S32). This projection device now projects markings onto the surface of O corresponding to the reference points O1, O2, ... (S32). Die Projektionseinrichtung muss in größerem Abstand zu der Oberfläche O angeordnet sein, um alle Orientierungspunkte O1, O2, ... projizieren zu können. The projection unit must be disposed at a greater distance to the surface of O, ... to be able to project to all reference points O1, O2,. Daher ist ein Projektor Therefore, a projector 15b 15b mit einer hohen Winkelgenauigkeit für zulässige Abweichungen der projizierten Markierungen von maximal 1 mm erforderlich. needed with a high angular accuracy for permissible deviations of the projected marks of maximum 1 mm. Eine mobile Projektions- und Triangulationseinrichtung A mobile projection and triangulation 70 70 wird von dem Roboter is of the robot 2 2 über einem Segment A positioniert (S34). over a segment A positioned (S34). Hierbei wird der Abstand zwischen der Projektionseinrichtung Here, the distance between the projection device 15a 15a und der Oberfläche O unter der nachfolgenden Bedingung minimiert. and the surface of O minimized under the following condition. Der Projektor The projector 15a 15a muss einen Bahnpunkt in jedem Bereich des Segments A projizieren können und die Triangulationseinrichtung must be able to project a track point in each region of the segment A and the triangulation 50a 50a , . 51a 51a muss mindestens drei der Orientierungspunkte O1, O2 erfassen. at least three of the landmarks O1, O2 must capture. Die Triangulationseinrichtung the triangulation 50a 50a , . 51a 51a bestimmt in dem Roboterkoordinatensystem die Koordinaten der Orientierungspunkte O1, O2. determined in the robot coordinate system the coordinates of the reference points O1, O2. Anhand des kinematischen Robotermodells der Robotersteuerung Based on the kinematic robot model of the robot controller 3 3 werden die Koordinaten des erfassten Orientierungspunkts O1 von dem Robotermodell in die Weltkoordinaten übertragen oder vice versa. the coordinates of the detected orientation point O1 is transmitted or from the robot model in the world coordinate vice versa. Zwischen den durch die Triangulationseinrichtung Between by triangulation 50a 50a , . 51a 51a erfassten und in das Weltkoordinatensystem übertragenen Koordinaten der Orientierungspunkte O1, O2 und den durch den Stift detected and transmitted in the world coordinate system coordinates of the reference points O1, O2 and by the pin 10 10 in den Weltkoordinatensystem festgelegten Koordinaten wird die Differenz bestimmt. in the world coordinate system specified coordinates, the difference is determined. Übersteigt die Differenz einen vorgegebenen Schwellwert, wird eine Eichung der mobilen Triangulationseinrichtung und/oder eine Anpassung des kinematischen Robotermodells durchgeführt (S36). If the difference exceeds a predetermined threshold, a calibration of the mobile triangulation and / or an adjustment of the kinematic robot model is performed (S36). Nachfolgend legt der Bediener mittels des Stifts Subsequently, the operator places by means of the pin 10 10 eine gewünschte Anzahl an Stützpunkten P7, P8, ... fest. a desired number of support points P7, P8, ... firmly. Der Projektor The projector 15a 15a projiziert wie in den anderen Ausführungsbeispielen eine Bahnkurve K2, K3 auf die Oberfläche O in dem Segment A. Nachdem die Bahnkurve in dem Segment A den gewünschten Vorgaben des Bedieners entspricht, wird der Roboter projected as in the other embodiments, a path curve K2, K3 onto the surface O in the segment A. After the trajectory in the segment A corresponds to the desired specifications of the operator, the robot is 2 2 in die nächste Pose verfahren und die Schritte S34 bis S37 für das Segment B in gleicher oder ähnlicher Weise wiederholt. process in the next pose and repeats steps S34 to S37 for the segment B in the same or a similar manner. Vorzugsweise weisen die Segmente A, B einen Überlappungsbereich auf. Preferably, the segments A, B have an overlapping portion. Eine Eichung des optischen Erfassungssystems und/oder eine Anpassung des Robotermodells kann auch mithilfe von selbstleuchtenden oder reflektierenden Orientierungsmarkern erfolgen. A calibration of the optical detection system and / or an adjustment of the robot model can also be done by using self-luminous or reflective orientation markers. Diese können gleich den Orientierungspunkten an ausgewählten Punkten der Oberfläche angeordnet werden. These can be arranged equal to the reference points at selected points of the surface. Mit einer geeigneten kalibrierten Vermessungseinrichtung werden zunächst die Koordinaten der Orientierungsmarker bestimmt. Calibrated with a suitable measuring device, the coordinates of the orientation marker are first determined. Die optische Erfassungseinrichtung erfasst dann die Koordinaten der Orientierungsmarker. The optical detection means then detects the coordinates of the orientation marker. Ergibt sich eine Abweichung zwischen den bestimmten und den erfassten Koordinaten kann das Robotermodell angepasst werden. results in a deviation between the determined and the detected coordinates, the robot model can be customized. Für reflektierende Orientierungsmarker kann vorteilhafterweise von der Projektionseinrichtung For reflective orientation marker may advantageously from the projection device 15a 15a oder einer zusätzlichen Einrichtung ein Lichtstrahl in eine fest eingestellte Richtung emittiert werden. or an additional device, a light beam emitted in a fixed direction. Antiparallel rückreflektierte Strahlen werden erfasst und aus deren Auftreffpunkt auf einem speziellen ortsauflösenden Sensor oder der optischen Erfassungseinrichtung unmittelbar die Koordinaten des Moduls Anti-parallel back-reflected rays are detected and from the point of impingement directly on a special position-resolving sensor or the optical detection means the coordinates of the module 70 70 bestimmt. certainly. In In 9 9 ist ein Flussdiagramm eines Verfahrens dargestellt, das ergänzend zu den zuvor beschriebenen Ausführungsbeispielen ausgeführt werden kann. a flow chart of a method is shown, which can be performed in addition to the previously described embodiments. Nachdem eine Bahnkurve K durch den Bediener festgelegt ist, wird diese an die Robotersteuerung After a trajectory K is set by the operator, this is to the robot controller 3 3 übermittelt (S40). transmitted (S40). Die Bahnkurve wird in geeignete Steuerdaten für ein in der Robotersteuerung The trajectory is in appropriate control data into the robot controller 3 3 enthaltenes kinematisches Robotermodell übertragen. contained kinematic robot model transfer. Nachfolgend wird die Bewegung des Roboters basierend auf dem kinematischen Robotermodell simuliert (S41). Subsequently, the movement of the robot is based on the kinematic robot model simulated (S41). Gegebenenfalls kann hierbei auch der Roboter real verfahren werden, vorzugsweise allerdings mit einem inaktiven Manipulator If necessary, the robot can be real process here, but preferably with an inactive manipulator 4 4 . , Während der Simulation wird bestimmt, welche Bahnpunkte der Roboter zu vorbestimmten Zeiten erreicht (S42). During the simulation it is determined that path points of the robot at predetermined times is reached (S42). Diese so bestimmten Bahnpunkte werden nachfolgend als Streckenpunkte bezeichnet. These so certain path points are referred to as waypoints. Vorzugsweise sind die vorbestimmten Zeitpunkte äquidistant verteilt. Preferably, the predetermined time points are distributed equidistantly. Dann sind die Abstände der Streckenpunkte zueinander ein Maß für die Geschwindigkeit, mit welcher der Roboter den Manipulator Then, the distances of the route points are to each other a measure of the speed with which the robot manipulator 4 4 entlang der Bahnkurve K bewegt. moves along the trajectory K. Die Koordinaten der Streckenpunkte werden an den Projektor The coordinates of the route points to the projector 15 15 , . 15a 15a übermittelt. transmitted. Dieser projiziert entsprechend den Streckenpunkten Markierungen entlang der Bahnkurve (S43). This projected in accordance with the route points markings along the path curve (S43). Somit erkennt der Bediener in intuitiver Weise, in welchen Bereichen der Manipulator Thus, the operator recognizes intuitive way, the areas in which the manipulator 4 4 aufgrund der Kinematik des Roboters sich schneller oder langsamer entlang der Bahnkurve K bewegen wird. will move due to the kinematics of the robot faster or slower along the trajectory K. Dies ist zB beim Aufbringen eines Klebers von Bedeutung. This is intended for applying an adhesive is important. In dem Bereich mit geringerer Geschwindigkeit muss entsprechend eine geringere Menge Kleber pro Zeiteinheit durch den Manipulator ausgegeben werden, damit der Kleber gleichmäßig aufgetragen wird. In the area with lower speed a lower amount of adhesive per unit of time according to needs to be output by the manipulator, so that the adhesive is uniformly applied. In In 10 10 ist grafisch die Bahnkurve K3 mit mehreren Markierungen T1, T2, ... entsprechend der Streckenpunkte dargestellt. the path curve K3 with multiple marks T1, T2, ... is displayed according to the route points graphically. Weitere zusätzliche Verfahrensschritte werden zusammen mit dem Flussdiagramm in Other additional steps, together with the flow chart 11 11 erläutert. explained. Nach einem Übermitteln einer festgelegten Bahnkurve an die Robotersteuerung (S50) wird die Führung des Manipulators After a transmission of a specified trajectory to the robot controller (S50) the guiding of the manipulator is 4 4 durch den Roboter by the robot 2 2 entlang der Bahnkurve K basierend auf dem kinematischen Robotermodell der Robotersteuerung along the trajectory K based on the kinematic model of the robot, the robot control 3 3 simuliert (S51). simulating (S51). Anhand des kinematischen Robotermodells werden unerreichbare Abschnitte der Bahnkurve K bestimmt (S52). inaccessible sections of the trajectory K are determined (S52) on the basis of the kinematic robot model. Die Unerreichbarkeit der einzelnen Abschnitte kann durch den Roboter The inaccessibility of the individual sections can be obtained by the robot 2 2 und dessen mechanischen Aufbau bedingt sein. and its mechanical structure be conditioned. Ferner sind die Räumlichkeiten zu berücksichtigen, in welchen der Roboter tätig ist. Furthermore, the premises are to be considered works in which the robot. Zudem müssen Stöße mit dem Werkstück vermieden werden. In addition, joints must be avoided with the workpiece. Hierfür werden dreidimensionale Modelle des Arbeitsraums bzw. des Werkstücks bereitgehalten. For this three-dimensional models of the work space or the workpiece to be kept. Während der Projektion der Bahnkurve K werden die unerreichbaren Abschnitte in einer anderen Farbe projiziert als die übrigen Abschnitte (S53). While the projection of the trajectory K the inaccessible portions are projected in a different color than the remaining portions (S53). Hierdurch erkennt der Bediener sofort, welche Bereiche erreichbar bzw. unerreichbar sind. In this way, the operator will immediately recognize which areas are accessible or inaccessible. In einer Alternative oder zusätzlich können Markierungen entlang den unerreichbaren Abschnitten projiziert werden (S54). In an alternative or in addition, markings along the inaccessible portions projected (S54). Die bisher beschriebenen Ausführungsbeispiele und Ergänzungen haben sich auf die Erfassung der Koordinaten des Stiftes bzw. der Koordinaten der Stützpunkte P1, P2, ... beschränkt. The embodiments and additions described so far have been limited to the detection of the coordinates of the pen or the coordinates of the points P1, P2, .... Für manche Manipulatoren For some manipulators 4 4 , zB Klebepistolen, ist nicht nur der Verlauf der Bahnkurve K für die ordnungsgemäße Bearbeitung des Werkstücks , For example, glue guns, not only the course of the path curve K for the proper processing of the workpiece 1 1 von Bedeutung, sondern auch die Orientierung des Manipulators important, but also the orientation of the manipulator 4 4 zu dem Verlauf der Bahnkurve K. In diesem Fall werden nicht nur die dreidimensionalen Koordinaten des Stifts to the course of the path curve K. In this case, not only the three-dimensional coordinates of the pen 10 10 erfasst, sondern auch dessen Orientierung im Raum. detected, but also its orientation in space. Diese bis zu sechs dimensionalen Daten werden an die Datenverarbeitungseinrichtung weitergeleitet. This up to six dimensional data are forwarded to the data processing device. Hierin wird neben der Interpolation zum Bestimmen einer Bahnkurve K zwischen den Stützpunkten P1, P2, ... auch eine Interpolation zwischen den verschiedenen Orientierungen des Manipulators zwischen den Stützpunkten P1, P2, ... durchgeführt. Herein, in addition to the interpolation to determine a trajectory K between the supporting points P1, P2, ... performed an interpolation between the different orientations of the manipulator between the supporting points P1, P2, .... Der Projektor The projector 15 15 , . 15a 15a projiziert wie zuvor beschrieben die Bahnkurve K auf die Oberfläche O des Werkstücks projected as before, the trajectory K described to the surface of the workpiece O 1 1 . , Zudem wird in vorbestimmten vorzugsweise regelmäßigen Abständen ein Symbol entlang der Bahnkurve K projiziert, das die Orientierung des Manipulators andeutet. In addition, at predetermined, preferably regular intervals along the trajectory symbol K is projected, which indicates the orientation of the manipulator. In In 12 12 sind beispielhaft solche Symbole X1, X2, ... dargestellt. are exemplary such symbols X1, X2, ... shown. Das Symbol weist eine Linie mit einer Pfeilspitze auf. The icon has a line on a arrowhead. Die Ausrichtung dieser Linie gibt die Orientierung des Manipulators in einer Ebene parallel zu der Oberfläche O an. The orientation of the line indicates the orientation of the manipulator in a plane parallel to the surface at O. Die Linie wird durch eine Markierung in zwei Abschnitte a und b unterteilt. The line is divided by a marker in two sections a and b. In dem Längenverhältnis der beiden Abschnitte a, b ist die Orientierung des Manipulators senkrecht zur Oberfläche kodiert. In the length ratio of the two sections a, b, the orientation of the manipulator is encoded perpendicular to the surface. So weist zum Beispiel der Manipulator nach unten, wenn der Abschnitt a nahe der Pfeilspitze länger als der Abschnitt b ist. Thus, for example, the manipulator down, if the portion A near the arrowhead portion is longer than the b.
Eine zweite Variante sieht zwei senkrecht zueinander angeordnete Pfeile vor, die die zB die x-Koordinate und die y-Koordinate repräsentieren. A second variant provides two mutually perpendicular arrows, for example, represent the x-coordinate and y-coordinate. Deren absoluten Längen geben die Orientierung des Manipulators in der xy-Ebene an. Their absolute lengths indicate the orientation of the manipulator in the xy plane. Deren relatives Längenverhältnis kodiert die z-Richtung des Manipulators. Their relative length ratio encodes the z-direction of the manipulator. Obwohl die vorliegende Erfindung anhand bevorzugter Ausführungsbeispiele beschrieben wurde, ist sie nicht darauf beschränkt. Although the present invention has been described with preferred embodiments, it is not limited thereto. Insbesondere sind eine Vielzahl verschiedener Projektoren verwendbar. In particular, a wide variety of projectors may be used. Diese können Laser mit mechanisch bewegten Ablenkeinrichtungen und/oder optomechanischen Ablenkeinrichtungen beinhalten. These may include lasers with moving mechanical deflectors and / or opto-mechanical deflector means. Andererseits sind auch Projektionseinrichtungen verwendbar, die zB mittels gesteuerter und lokal begrenzter Abschattung durch Flüssigkristallanzeigen und/oder beleuchtete Kippspiegel-Anordnungen (Digital Light Processing Arrays) Muster auf die Oberfläche projizieren können. On the other hand, projection devices are useful, for example, by means of controlled and localized shading by liquid crystal displays and / or illuminated tilting mirror arrangements (Digital Light Processing arrays) patterns can be projected onto the surface. Der Zeiger ist als taktil berührender Stift in den Ausführungsbeispielen beschrieben. The pointer is described as tactile touching pen in the embodiments. Jedoch kann dieser auch durch einen Lichtstrahl gebildet werden. However, this can also be formed by a light beam. Die Koordinaten von dem angestrahlten Punkt auf der Oberfläche werden durch eine geeichte optische Erfassungseinrichtung bestimmt. The coordinates of the illuminated spot on the surface are determined by a calibrated optical detection means. Das Grundprinzip entspricht somit der Erfassung der Koordinaten der Spitze des Stifts. The basic principle thus corresponds to the detection of the coordinates of the tip of the pen. Die Anordnung der Datenverarbeitungseinrichtung kann getrennt oder integriert in einer der anderen Einrichtungen erfolgen. The arrangement of the data processing device can be done separately or integrated into one of the other facilities. Verfahren zum Einrichten einer Bahnkurve einer Robotervorrichtung, mit den folgenden Schritten: (a) Anordnen eines Werkstücks mit wenigstens einer zu bearbeitenden Oberfläche (O) im Arbeitsbereich der Robotervorrichtung ( A method for setting a trajectory of a robot device, comprising the steps of: (a) arranging a workpiece with at least one surface to be machined (O) (in the working range of the robot apparatus 2 2 ), (b) Positionieren einer Zeigereinrichtung ( ), (B) positioning a pointing device ( 10 10 ) an einer Mehrzahl von Stütz-Punkten (P1, P2, ...) auf der zu bearbeitenden Oberfläche (O), (c) Festlegen der Koordinaten der Stütz-Punkte (P1, P2, ...) durch Erfassen der zugehörigen Koordinaten der Zeigereinrichtung ( ) At a plurality of supporting points (P1, P2, ...) on the surface to be machined (O), (c) determining the coordinates of the supporting points (P1, P2, ...) by detecting the associated coordinates the pointing device ( 10 10 ), (d) automatisches Interpolieren von Wegstrecken zwischen jeweils zwei benachbarten Stütz-Punkten (P1, P2, ...) gemäß einem vorbestimmten Algorithmus zum Festlegen der Bahnkurve (K, K1, ...), (e) Projizieren der Bahnkurve (K, K1, ...) auf der zu bearbeitenden Oberfläche (O), (f) optisches Erfassen der projizierten Bahnkurve (K, K1, ...) auf der zu bearbeitenden Oberfläche (O), (g) Bestimmen von abweichenden Abschnitten (K', K'1) der projizierten Bahnkurve (K, K1, K', K'1, ...), in denen die projizierte Bahnkurve (K, K1, K', K'1, ...) von der festgelegten Bahnkurve (K, K1, ...) abweicht und (h) Projizieren von Abweichungs-Markierungen an und/oder entlang der abweichenden Abschnitte (K', K'1, ...). ), (D) automatically interpolating paths between each two adjacent supporting points (P1, P2, ...) according to a predetermined algorithm for determining the path curve (K, K1, ...), (e) projecting the trajectory ( K, K1, ...) (on the surface to be machined optical O), (f) detecting the projected trajectory (K, K1, ...) on the surface to be machined (O), (g) determining from different portions (K ', K'1) of the projected path line (K, K1, K', K'1, ...), in which the projected trajectory (K, K1, K ', K'1, ...) of deviates the specified path curve (K, K1, ...) and (h) projecting deviation marks and / or along the divergent portions (K ', K'1, ...). Verfahren nach Anspruch 1, wobei das optische Erfassen der projizierten Bahn durch Triangulation erfolgt. The method of claim 1, wherein the optical detecting of the projected track is performed by triangulation. Verfahren nach einem der Ansprüche 1 oder 2, in dem die Abweichungs-Markierungen Symbole aufweisen und/oder die abweichenden Abschnitte (K', K'1, ...) durch eine von den anderen Abschnitten der Bahnkurve (K, K1, ...) in unterschiedlicher Farbgestaltung projiziert werden. A method according to any one of claims 1 or 2, in which the deviation marks have symbols and / or the divergent portions (K ', K'1, ...) (by an other of the portions of the trajectory K, K1, .. .) are projected in different colors. Verfahren nach einem der Ansprüche 1 bis 3, das eine iterative Anpassung der Bahnkurve (K, K1, ...) vornimmt, bis die Abweichung unter einen vorbestimmten Schwellwert sinkt. Method according to one of claims 1 to 3, an iterative adjustment of the path curve (K, K1, ...) performs, until the deviation drops below a predetermined threshold. Verfahren nach einem der Ansprüche 1 bis 4, wobei eine Krümmung der Oberfläche (O) basierend auf der Abweichung bestimmt wird und das automatische Interpolieren in Abhängigkeit der Krümmung erfolgt. Method according to one of claims 1 to 4, wherein a curvature of the surface (O) is determined based on the deviation and takes place automatically interpolating function of the curvature. Verfahren nach einem der vorhergehenden Ansprüche mit den weiteren Schritten: (i) Simulieren eines Führens der Robotervorrichtung ( Method according to one of the preceding claims comprising the further steps: (i) of guiding the robot simulation apparatus ( 2 2 ) entlang der festgelegten Bahnkurve (K, K1, ...) basierend auf einem kinematischen Modell der Robotervorrichtung ( ) (Along the predetermined path curve K, K1, ...) based (on a kinematic model of the robot apparatus 2 2 ), (j) Bestimmen von ersten Punkten der Bahnkurve (K, K1, ...), die die Robotervorrichtung ( ), (J) determining first points of the path curve (K, K1, ...) that (the robot apparatus 2 2 ) beim simulierten Führen zu vorbestimmten Zeitpunkten erreicht und (k) Projizieren von Zeit-Markierungen (T1, T2, ...) entlang der Bahnkurve (K, K1, ...) an den Koordinaten der ersten Punkte. ) Reaches the simulated performing at predetermined times, and (k) projecting from time-marks (T1, T2, ...) along the path curve (K, K1, ...) to the coordinates of the first points. Verfahren nach einem der vorhergehenden Ansprüche mit den weiteren Schritten: (l) Simulieren eines Führens der Robotervorrichtung ( Method according to one of the preceding claims with the further steps of: (l) performing simulation of a robot device ( 2 2 ) entlang der festgelegten Bahnkurve (K, K1, ...) basierend auf einem kinematischen Modell der Robotervorrichtung ( ) (Along the predetermined path curve K, K1, ...) based (on a kinematic model of the robot apparatus 2 2 ), (m) Bestimmen von zweiten Punkten der Bahnkurve (K, K1, ...), für die die Robotervorrichtung ( ), (M) determining points of the second path curve (K, K1, ...) such that (the robot apparatus 2 2 ) Posen einnehmen, welche zur Kollision mit dem Werkstück ( taking) poses, which (to the collision with the workpiece 1 1 ) und/oder einer Arbeitsumgebung führen und/oder für welche das Simulieren ergibt, dass die Posen für die Robotervorrichtung ( ) And / or a working environment lead and / or for which the simulation shows that the float for the robotic device ( 2 2 ) uneinnehmbar sind und (n) Projizieren von Kollisions-Markierungen entlang der projizierten Bahnkurve (K, K1, ...) an den Koordinaten der zweiten Punkte. ) Are impregnable and (n) projecting collision marks along the projected path curve (K, K1, ...) to the coordinates of the second points. Verfahren nach einem der vorhergehenden Ansprüche, dadurch gekennzeichnet, dass die Bahnkurve (K, K1, ...) mittels einer mobilen Projektionseinrichtung ( Method according to one of the preceding claims, characterized in that the path curve (K, K1, ...) (by means of a mobile projection device 15a 15a ) projiziert wird, die nahe oder anstelle eines Manipulators an der Robotervorrichtung ( ) Is projected, the (near to or instead of a manipulator on the robotic device 2 2 ) fest oder lösbar angeordnet ist. ) Is fixedly or releasably. Verfahren nach Anspruch 8, wobei die zu bearbeitenden Oberfläche (O) in mehrere Segmente (A, B) aufgeteilt wird und für jedes Segment (A, B) die mobile Projektionseinrichtung ( The method of claim 8, wherein the surface to be machined (O) into several segments (A, B) is divided, and for each segment (A, B), the mobile projection device ( 15a 15a ) durch die Robotervorrichtung ( ) (By the robotic device 2 2 ) automatisch in eine Pose geführt wird, von welcher aus die mobile Projektionseinrichtung ( ) Is automatically guided into a pose, from which the mobile projection device ( 15a 15a ) auf jeden Punkt des ausgewählten Segments (A, B) projizieren kann und die mobile Projektionseinrichtung ( ) (On each point of the selected segment A, B) can project and the mobile projection device ( 15a 15a ) bei dieser Pose einen geringen Abstand zur Oberfläche (O) aufweist, bevor durch die Zeigereinrichtung ( ) At this pose has a small distance from the surface (O), before (by the pointing device 10 10 ) und deren Erfassung eine Mehrzahl von Stütz-Punkten (P1, P2, ...) in dem Segment (A, B) der Oberfläche (O) festgelegt werden. ) And their detection, a plurality of support points (P1, P2, ...) are set in the segment (A, B) of the surface (O). Verfahren nach einem der Ansprüche 8 oder 9, wobei eine Mehrzahl von Orientierungspunkten (O1, O2, ...) festgelegt und mittels einer stationären Projektionseinrichtung ( A method according to any one of claims 8 or 9, wherein a plurality of reference points (O1, O2, ...) and set (by means of a stationary projecting means 15 15 ) auf die zu bearbeitende Oberfläche (O) projiziert werden und die mobile Projektionseinrichtung ( ) (On the surface to be machined O) are projected, and the projection mobile device ( 15a 15a ) zusammen mit einer optischen Erfassungseinrichtung ( ) (Together with an optical detection means 50a 50a , . 51a 51a ) mittels der Robotervorrichtung ( ) (By the robotic device 2 2 ) automatisch in eine Pose geführt wird, von welcher aus die optische Erfassungseinrichtung ( ) Is automatically guided into a pose, from which the optical detecting means ( 50a 50a , . 50b 50b ) mindestens drei Orientierungspunkte (O1, O2, ...) erfasst. ) Detects at least three reference points (O1, O2, ...). Verfahren nach Anspruch 10, wobei eine Kalibrierung der optischen Erfassungseinrichtung ( The method of claim 10, wherein a calibration of the optical detecting means ( 50a 50a , . 51a 51a ) und/oder der Projektionseinrichtung ( () And / or the projection unit 15 15 , . 15a 15a ) und/oder des Robotermodells basierend auf einem Unterschied zwischen den festgelegten Koordinaten der Orientierungspunkten (O1, O2, ...) und den erfassten Koordinaten der projizierten Orientierungspunkten (O1, O2, ...) erfolgt. ) And / or the robot model based on a difference between the specified coordinates of the reference points (O1, O2, ...) and the detected coordinates of the projected points of orientation (O1, O2, ...) is effected. Verfahren nach einem der vorhergehenden Ansprüche, wobei eine Mehrzahl von reflektierenden oder selbstleuchtenden Orientierungsmarkern auf der zu bearbeitenden Oberfläche (O) an bekannten Koordinaten angeordnet werden, die optische Erfassungseinrichtung ( Method according to one of the preceding claims, wherein a plurality of reflective or are self-luminous orientation markers on the surface to be machined (O) disposed at known coordinates, (the optical detection means 50 50 , . 51 51 , . 50a 50a , . 51a 51a ) die Koordinaten der Orientierungsmarker erfasst und eine Kalibrierung der optischen Erfassungseinrichtung ( ) Detects the coordinates of the orientation marker and (a calibration of the optical detecting means 50 50 , . 51 51 , . 50a 50a , . 51a 51a ) und/oder der Projektionseinrichtung ( () And / or the projection unit 15 15 , . 15a 15a ) und/oder des Robotermodells basierend auf einem Unterschied zwischen den bekannten Koordinaten der Orientierungsmarker und den erfassten Koordinaten der Orientierungsmarker erfolgt. ) And / or of the robot model is based on a difference between the known coordinates of the orientation marker and the detected coordinates of the orientation marker. Verfahren nach einem der vorhergehenden Abschnitte, wobei die Koordinaten der Stütz-Punkte (P1, P2, ...) mit sechs Koordinaten zur Beschreibung der räumlichen Lage und der Orientierung festgelegt werden. Method according to one of the preceding sections, the coordinates of the supporting points (P1, P2, ...) can be defined with six coordinate for describing the spatial position and orientation. Verfahren nach einem der vorhergehenden Abschnitte, wobei ein Orientierungsverlauf entlang der Bahnkurve (K, K1, ...) durch automatische Interpolation ermittelt wird. Method according to one of the preceding sections, wherein an orientation pattern along the trajectory curve (K, K1, ...) is determined by automatic interpolation. Verfahren nach einem der vorhergehenden Abschnitte, wobei richtungsangebenden Markierungen (X1, X2, ...) entsprechend dem Orientierungsverlauf entlang der Bahnkurve (K, K1, ...) auf die Oberfläche (O) projiziert werden. Method according to one of the preceding sections, said direction indicating marks (X1, X2, ...) corresponding to the orientation pattern along the trajectory curve (K, K1, ...) onto the surface (O) to be projected. Vorrichtung zum Durchführen eines der Verfahren nach den Ansprüchen 1 bis 12, aufweisend (o) eine Zeigereinrichtung ( An apparatus for performing one of the methods according to claims 1 to 12, comprising (o) a pointing device ( 10 10 ), (p) eine Verfolgungseinrichtung ( ), (P) a tracking device ( 11 11 ) zum Erfassen der Koordinaten und/oder der Orientierung der Zeigereinrichtung ( ) (For detecting the coordinates and / or orientation of the pointing device 10 10 ), (q) eine Datenverarbeitungseinrichtung ( ), (Q) a data processing device ( 20 20 ) zum automatischen Interpolieren von Wegstrecken zwischen jeweils zwei benachbarten Stütz-Punkten (P1, P2, ...) zum Festlegen der Bahnkurve (K, K1, ...), (r) eine Projektionseinrichtung ( ) For automatically interpolating paths between each two adjacent supporting points (P1, P2, ...) for setting the path curve (K, K1, ...), (r) (a projection device 15 15 ; ; 15a 15a ) zum Projizieren der Bahnkurve (K, K1, ...) auf die Oberfläche (O) und (s) eine optische Erfassungseinrichtung ( ) (For projecting the trajectory K, K1, ...) onto the surface (O) and (s) optical detection means ( 50 50 , . 51 51 ; ; 50a 50a , . 51a 51a ) zum Erfassen einer projizierten Bahnkurve (K, K1, ...) aufweist. has) (for detecting a projected trajectory K, K1, ...). Vorrichtung nach Anspruch 16, wobei die Projektionseinrichtung ( The apparatus of claim 16, wherein the projection means ( 15 15 ; ; 15a 15a ) mindestens eine Laserlichtquelle und eine Ablenkeinrichtung zum Richten mindestens eines Laserlichtstrahls aufweist. ) Having at least one laser light source and deflecting means for directing at least one laser light beam. Vorrichtung nach einem der Ansprüche 16 bis 17, wobei die Projektionseinrichtung ( Device according to one of claims 16 to 17, wherein the projection means ( 15 15 ; ; 15a 15a ) und/oder die optische Erfassungseinrichtung ( () And / or the optical detection means 50 50 , . 51 51 ; ; 50a 50a , . 51a 51a ) stationär bezogen auf einen Arbeitsraum des Roboters ( ) Stationary relative (to a working space of the robot 2 2 ) angeordnet sind. ) Are arranged. Vorrichtung nach einem der Ansprüche 16 bis 19, wobei die Projektionseinrichtung ( Device according to one of claims 16 to 19, wherein the projection means ( 15 15 ; ; 15a 15a ) und/oder die optische Erfassungseinrichtung ( () And / or the optical detection means 50 50 , . 51 51 ; ; 50a 50a , . 51a 51a ) fest und/oder lösbar an der Robotervorrichtung ( ) Fixedly and / or releasably (at the robotic device 2 2 ) angeordnet sind. ) Are arranged. ES2309259T3 (en) * 2003-08-29 2008-12-16 Trumpf Laser- Und Systemtechnik Gmbh Remote device for machining workpieces using a laser beam machining.